Reinvent the car. Convert mankind from fossil fuels to solar power. Colonize Mars. Elon Musk is known for his ambitious goals. His latest is a surprise plan to take Tesla private. Musk wants to be free from the pressures of Wall Street, particularly the short-sellers who are betting that his beloved company will fail. But there are reasons to doubt it will happen. The company is planning a factory in China that will cost at least $2 billion. It's looking at building another in Europe. 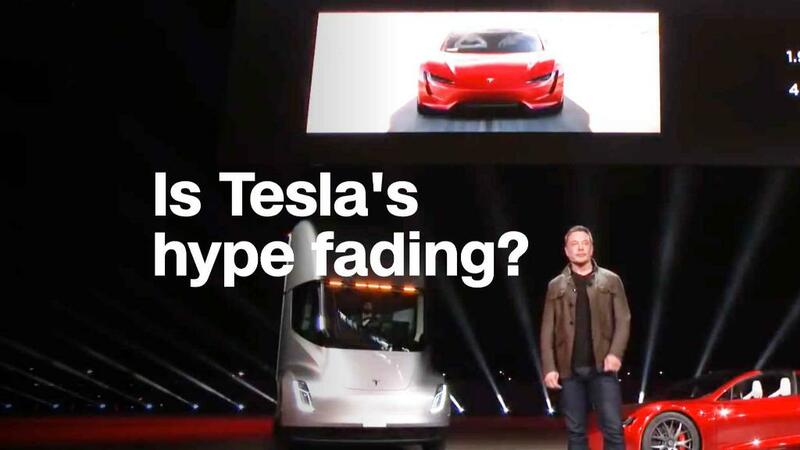 Tesla also needs to open many more stores, both in the United States and around the world, and it doesn't believe in the dealership model used by its competitors, which shifts costs to independent dealers. Most immediately, Tesla needs cash because it has a lot of debt coming due in the next eight months — $230 million in November and $920 million more in March, according to Moody's. That's why Moody's, the ratings agency, believes the company will need to raise billions in the next year, and why its debt rating has been cut deep into junk-bond status, with further downgrades likely. Musk insists Tesla will get the cash it needs by selling more cars. Until now, Tesla has been able to turn to its fans on Wall Street for the cheap money it has needs to pay for growth. That spigot will be shut off if Tesla goes private. The new tax law makes it more difficult. The law limits how much interest companies can deduct on their borrowing. That will make it more difficult for companies to carry heavy debt loads. And taking a company private means taking on a great deal of debt. That's one reason experts say Dell is looking at going public again, only five years after it went private: It could use the money from stock sales to pay down debt. Wall Street isn't buying it. Tesla stock has had an incredible run in the eight years since the company went public. But it has never approached the $420 per share that Musk is proposing to offer investors. If Wall Street believed that $420 were a realistic price, and that the deal was likely to happen, the stock would have quickly approached that level. Instead, shares only hit a high of $387 on Tuesday. And shares of Tesla (TSLA) fell on Wednesday. Investors clearly can't always predict the future. But their collective judgment says a lot about the chances that the deal will happen. Tesla declined comment. Taking companies private is expensive — and risky. The largest deal ever to take a company private was the $31.8 billion purchase of TXU, a Texas utility, in 2007. Taking Tesla private at Musk's proposed price would cost almost twice as much. And TXU, which became Energy Future Holdings Corporation, filed for bankruptcy in 2014. That is not uncommon when companies assume the debt it takes to go private. A more recent example is Toys "R" Us, which went out of business this year, more than a decade after it was taken private and was saddled with an unmanageable $5.3 billion in debt. Musk has a 20% stake. He says he'll hang on to those shares, so they don't have to be purchased as part of this deal. It would cost $57 billion for a private equity firm or bank to buy the remaining 80%. Individual investors own an additional 20% of the company. If they all held on to their stakes, too, it would still cost about $43 billion to go private. Despite Musk's promise of "funding secured" at $420 a share, it would be tough to raise that kind of money, especially with corporate debt already at record levels. Tesla still hasn't proved it can turn a profit. That's a big reason its debt is rated at junk-bond status. Tesla's scramble to meet an ambitious production target for the Model 3, its least expensive car, just caused it to report the biggest loss in its history. Musk insists the company will be profitable in the second half of this year, but he has a history of over-promising and missing deadlines. Musk famously dislikes the criticism and scrutiny that come with being a public company, but going private would be much easier if Tesla could prove to the market that it can build and sell enough cars to be profitable.